"It's my goal to start a spay and neuter campaign in 2019." As the founder, I’m involved in pretty much anything and everything. Primarily though, I deal with the logistics in terms of selecting dogs, transport and the vets here and in Romania. I am also heavily involved with our volunteers, helping at kennels, assessing dogs, being back up/support for our adopters, and sorting aid to go to Romania. 5 years ago I was on Facebook, scrolling through my news feed when I came across a little doggie named Basil who was in desperate need of a home. I read his story and it broke my heart. He’d been rescued from a kill shelter in Romania where his time was nearly up. He’d caught distemper and was extremely poorly at the vets for many months. They weren’t sure he’d make it, but he’s a fighter and he survived! I wasn’t actually looking for a dog as my life was pretty hectic with a full time office job and my horses, but there was something about this little guy that made me want to help him. Within 10 minutes of halfheartedly commenting on the post, I was on the phone to the rescuer agreeing to adopt him!!!! I then began following the work of his rescuer and donated £600 from the proceeds of the sale of my horse, which covered Basil’s fees and saved 3 more dogs. I was hooked on rescuing Rommies! Basil arrived at South Mimms service station and I remember thinking “what the hell have I done? !” He was so frightened. He’d caught mange and had no hair on his face or legs, he looked awful. After having him a week, it was evident how much abuse the little fella had endured as he had a serious attitude!!! Basil changed my life! I stopped working in an office and started my dog walking business, Dogs Walk This Way.. He motivated me to look in more detail at the plight of the Romanian dogs. A few weeks after I adopted him, I formed a charity called UK Romanian Dog Rescue which I ran together with two other ladies. We were lucky enough to be gifted some lovely kennels by the lovely Julia Stephenson meaning we could help more dogs. I traveled to Romania on rescue missions, helping as many dogs as possible by medicating and feeding them, and bringing those we could to the UK. After Basil, I adopted another boy who was found wandering the streets and had luckily managed to evade capture by the dreaded dog catchers. I named him Chaz. 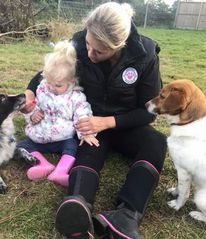 Not long after that, two years into running the charity, I decided to set up my own rescue, and started the Dogs Walk This Way Rescue arm of my dog walking business. In the past 3 years, with the help of some wonderful people, I am proud to say, I have rehomed over 500 doggies. I couldn’t have done it without such amazing support and it’s amazing to now have a wonderful, dedicated team. All who know me will tell you how passionate I am about animals. I’ve always been around them, have worked with horses most of my life and have two of my own. I also have two rescue cats and of course, my two amazing little rescue dogs.